The Black Pearl cigar is a Nicaraguan hand rolled cigar with Nicaragua filler and binder with Ecuador wrapper. It has a nutty flavor with hints of wood. A mild smoke with a decent burn. Cigar Aficionado rated it an 88 and the cost is around $5 USD. I prefer to punch the end rather than cut it. It makes the draw more intense and centered and you dont get the tip all sloppy. 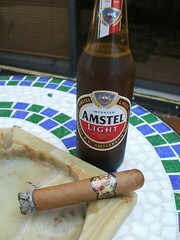 I dont normally drink a beer with a cigar, but it was a hot sunny day and it just felt right. I got mine is a bakers dozen variety pack from Thompson Cigars. I do recommend it, not the best I've ever had, but it was memorable.